The CCMS 6th Grade Volleyball team played in the Morris Saratoga Tournament on February 9. 10 teams from the area competed in the tournament. The Warriors earned first place in Pool Play with a 3-1 record. The Warriors defeated MVK, Saratoga and Seneca while their only loss was to Pontiac St. Mary's. 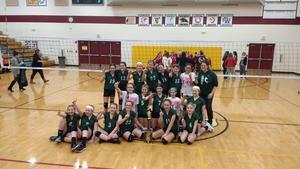 The Warriors played in the Championship match vs. Ottawa Central. The girls fought hard throughout the championship match and defeated Ottawa Central and won won 1st Place! Coach Horrie is very proud of all your hard work and determination. Great teamwork this weekend and congratulations on a wonderful season!